On this mission, James Bond is tracking the villainous Goldfinger from Miami to Kent and across to France, before catching up with the gold-obsessed smuggler in Geneva. 007 must infiltrate Goldfinger's organization and pit his wits against the manic villain just to stay alive. The plot climaxes at the gold repository at Kentucky's Fort Knox and 007 must foil Goldfinger's greedy scheme. MI6 dusts of the archive and uncovers unseen material from the early stages of Bond's mission in Miami. Bond has visited the East coast on a number of missions, in fact "Goldfinger" finds 007 in glitzy Miami beach for the second time in seven adventures. Readers join the mission when the Secret Agent is nursing a bourbon on the rocks at Miami International, on rest and recuperation leave from MI6, albeit temporary. By this time, Bond is lamenting a normal, easy life after a grueling assassination mission in Mexico before he is recruited by an old acquaintance to help unravel the technique of a devilish card cheat, Auric Goldfinger. To spy on the game between Goldfinger and his American acquaintance, Du Pont, Bond heads to the extravagant Fontainebleau hotel. 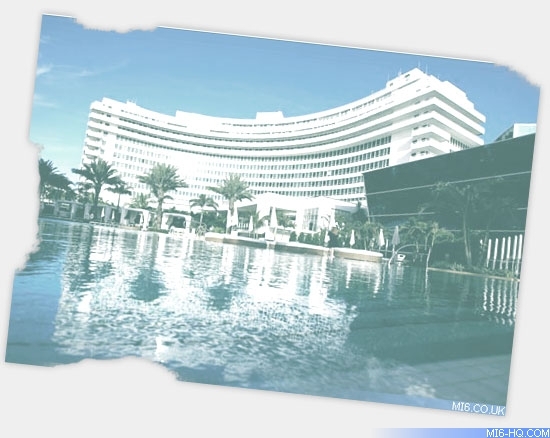 Opened in 1954, the real Fontainebleau has the distinguished record of having been host to ever American President since Eisenhower. 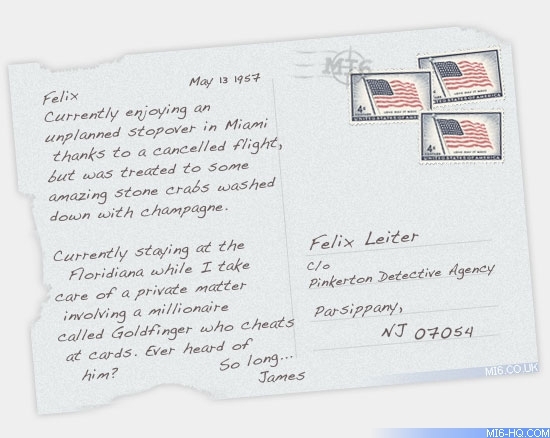 Fleming takes his hero to Joe's Stone Crab restaurant on the bright beachfront before facing off with Goldfinger. One of the regular fixtures of Miami beach, the restaurant was founded in 1913 and remains a popular haunt today. Bond comments that Joe's Stone Crab turns out the most delicious meal he had ever experienced. Just when he thinks he is getting a taste of becoming a PI to the wealthy and superstitious, Bond discovers that there's more to Goldfinger than a card cheat and is recalled to the UK to investigate the matter in his official capacity as an agent for the British government. Bond heads to Kent to face off on the links with the brash and bold Goldfinger. Bond checks into Channel Parket in Ramsgate before teeing off at Royal St. Marks Golf Course, Sandwich. Bond, an adamant golfer like Fleming, since his teens reportedly played a round every weekend at the courses nearby to his London flat but Fleming reports that his secret agent had not played at St. Marks in a score of years. The Royal St. Marks was a semi-fictional Fleming concoction - heavily based on his favourite course, Royal St. Georges. Fleming changed the name of the club professional of the time from Alfred Whiting to Alfred Blacking and the name of one of the bunkers from "the Maiden" to "the Virgin". Incidentally, the 1964 film sees 007 and Goldfinger face off at the Stoke Poges, doubling for the Royal St. Georges. After the in-depth golf match Bond tails Goldfinger in his Aston Martin DB III, courtesy of MI6. Bond is able to keep his distance from the villains Rolls Royce as he weaves through the French countryside on the N1 through Abbeville. The secret agent looses track of Goldfinger when a fork in the road sees 007 heading towards Paris whilst the homing device attached to Goldfinger's Rolls forked off to Evreux and Chartres. After a night in the Hôtel de la Gare, a inconspicuous station hotel, Bond continues his patient tracing of the villain towards Nevers and Moulins. Before Bond can reach the turn for Moulin, 007 is distracted by a Triumph, driven by a pretty girl. Finally, the trail ends in Geneva, Switzerland - where the real life Chateau Staël resides. Bond assesses the nearby area and calls into the Secret Service post at Quai Wilson before checking into the Hôtel des Bergues. Bond calls in for supper at "the Bavaria, a modest Alsation brasserie that had been the rendezvous of the great in the days of the League of Nations." Whilst casing Goldfinger's heavily guarded headquarters Bond runs into Tilly Soams, whom he recognizes as the driver of the Triumph. In the confusion they are discovered by the Korean heavy, Oddjob and taken to Goldfinger who declares: "they have a saying in Chicago: 'Once is happenstance. Twice is coincidence. The third time it's enemy action.' Miami, Sandwich and now Geneva. I propose to wring the truth out of you." Bond is flown in Goldfinger's private jet to New York and by road to Kentucky, home of the gold repository, Fort Knox. The famed and illustrious bullion store is the ideal place for Goldfinger to prove his worth as a master thief, although the practicalities of shifting tons of bullion from the vaults in no time at all was something Fleming seems to have overlooked in his aurum-tinted adventure.